In Goldman's latest quarterly hedge fund trend monitor - a survey of 808 hedge funds with $2.1 trillion of gross equity positions ($1.5 trillion long and $649 billion short) - which analyzes hedge fund holdings as of Dec. 31, the bank makes some interesting observations about the current state of the hedge fund industry. In terms of holdings, hedge funds stuck with the deflationary themes of growth and momentum despite 4Q tax and interest rate volatility. Tax reform and rising Treasury yields weighed on Technology and other fund favorites in late 4Q. Although funds trimmed their Tech overweight, Goldman found that the tech sector remains the largest net portfolio weight (24%) and the bulk of Goldman's VIP list (38%). Financials remained the largest net underweight (-445 bp); even as hedge fund paralysis, first noted last quarter, remained as portfolio turnover hovered near record lows. PERFORMANCE AND SENTIMENT: The average equity hedge 1. fund has returned 2% YTD, matching the S&P 500. The most popular hedge fund long positions have resumed their 2017 outperformance in early 2018. Funds returned 13% in 2017. Our Hedge Fund VIP basket of most popular long positions has returned 4% YTD, outperforming the S&P 500 during the recent correction in contrast to its typical drawdown behavior. Our growth and momentum factors and the Info Tech sector have outperformed alongside our VIP basket, aiding fund returns following weakness in late 2017. LEVERAGE: Hedge funds entered 2018 with near-record leverage and maintained risk despite the correction. Funds added nearly $20 billion of net exposure in two index ETFs alone (SPY and IWM) as ETF exposure rose to 3% of long portfolios. Although the S&P 500 suffered its first 10% decline in two years, funds maintained conviction in their positions. Portfolio turnover rose slightly but remained near recent record lows at 28%. VERY IMPORTANT POSITIONS: Our Hedge Fund VIP list (ticker: GSTHHVIP) of the most popular long positions has led the S&P 500 by 170 bp YTD after outperforming by 450 bp in 2017 (26% vs. 22%). 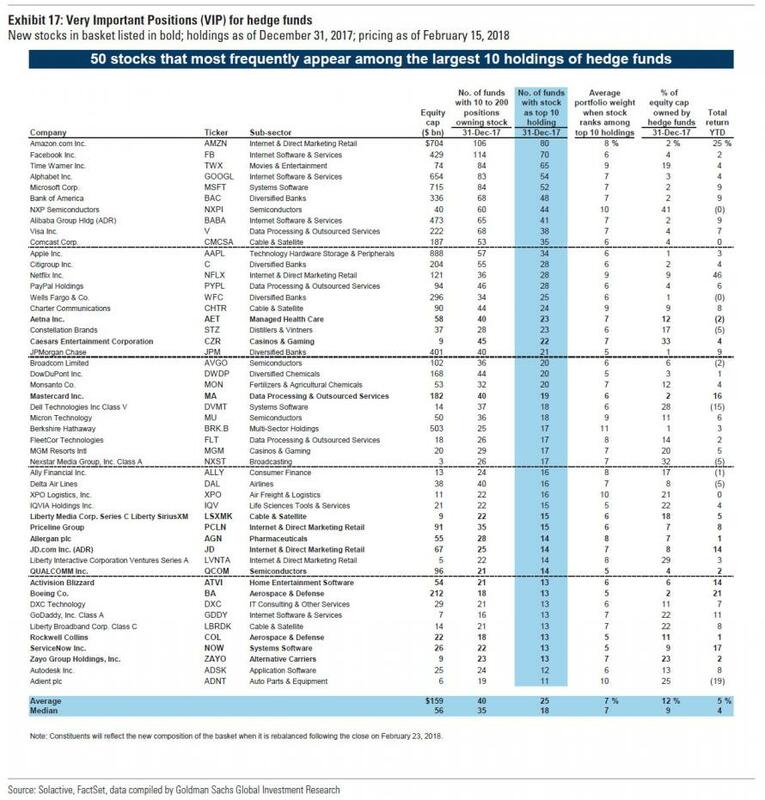 The VIP list contains the 50 stocks that appear most often among the top 10 holdings of fundamentally-driven hedge funds. The list’s top 5 stocks are AMZN, FB, TWX, GOOGL, and MSFT. The basket has outperformed the S&P 500 in 64% of quarters since 2001, generating an average quarterly excess return of 59 bp. 13 new constituents this quarter: AET, AGN, ATVI, BA, COL, CZR, JD, LSXMK, MA, NOW, PCLN, QCOM, and ZAYO. SECTORS: Hedge fund sector allocations remained largely stable, with funds declining to rotate toward perceived “winners” of tax reform and rising interest rates. Information Technology remains the largest sector weight (24%) although funds trimmed the overweight tilt relative to the Russell 3000 to +107 bp from +307 bp last quarter. Consumer Discretionary is the largest overweight tilt (+432 bp), but positions in the Consumer Discretionary and Energy sectors remain near the smallest tilts that funds have held in those sectors during the last five years. Funds added to their overweight in Health Care (+354 bp) while Financials remains the largest net underweight (-445 bp). HIGHLY CONCENTRATED STOCKS: The most concentrated hedge fund stocks have lagged the S&P 500 by 200 bp YTD following unusually weak returns in 2017. The basket of 20 firms with the largest share of market cap owned by hedge funds (ticker: GSTHHFHI) lagged the S&P 500 by 11 pp in 2017, its worst annual performance since 2007. The weakness was driven primarily by two Health Care firms (EVHC and INCY). The basket had outgained the S&P 500 by an average of 9 pp in each of the five years from 2012-16. 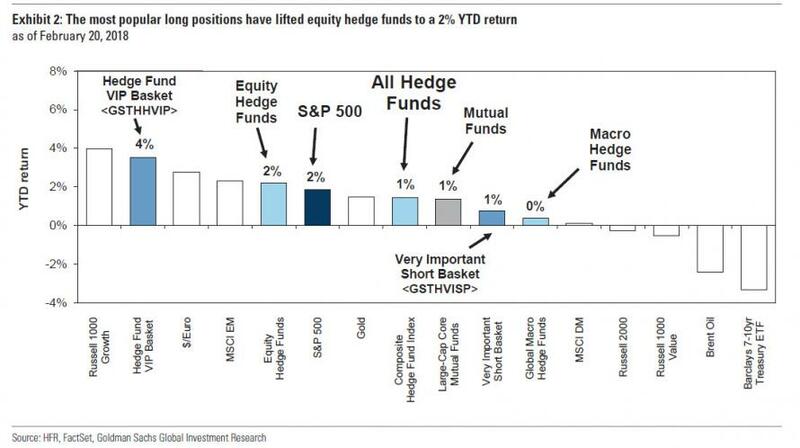 One especially interesting observation is that the most crowded hedge fund positions, i.e. 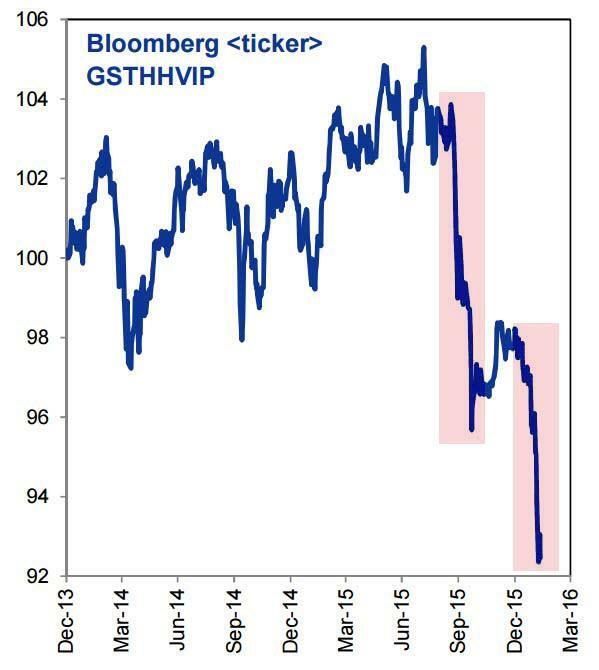 Goldman's Hedge Fund VIP basket, outperformed, as it appears that hedge funds rushed to the "safety" of crowded positions during the recent market swoon, hoping that others had done their homework and that these stocks would not get sold. So far, this assumption has proven correct. Goldman also touches on a topic we discussed earlier in the context of the Fed's Monetary Policy Report, which warned about record hedge fund leverage. To be sure, hedge funds continued the trend observed last quarter, as elevated investor positioning at the start of 2018, including hedge fund leverage, remained and according to Goldman's David Kostin helped explain the sharp S&P 500 drawdown. Specifically, funds added net leverage entering 2018, "anticipating continued strength in equities following the passage of tax reform and a 7% S&P 500 return in 4Q 2017." Our analysis of fund filings and short interest data suggests that funds carried a net long exposure of 56%, above the long term average and nearly the highest level on record. 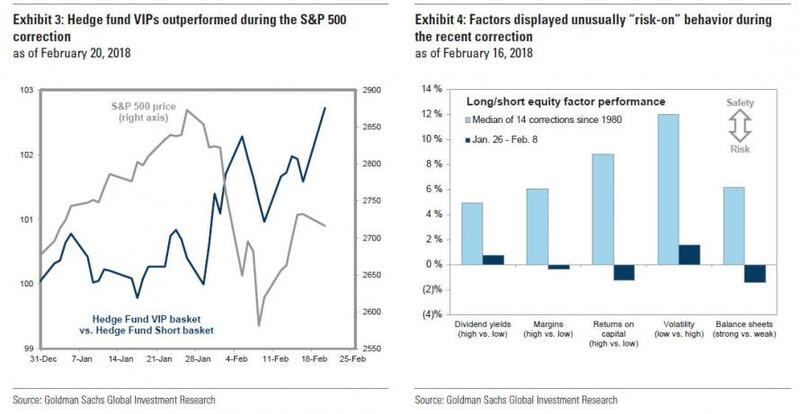 Furthermore, data from Goldman's Prime Services on exposures showed extremely elevated net and gross leverages prior to the market correction. And although net leverage dropped briefly during the correction, Goldman Prime attributed the decline to mark-to-market dynamics in options positions. Meanwhile, both gross and net exposures currently remain close to recent highs. Record hedge fund leverage occurred alongside unprecedented net length in US equity futures, historically low mutual fund cash allocations, and all-time high margin debt as a share of market cap. Also notable: the lack of trading volumes continues to be explained with one simple observation: hedge funds continue to boycott turnover - and trading even as they concentrate even more into the top 10 positions. The average hedge fund held 68% of its long portfolio in its top 10 positions, just below the record “density” of 69% in 1H 2016. 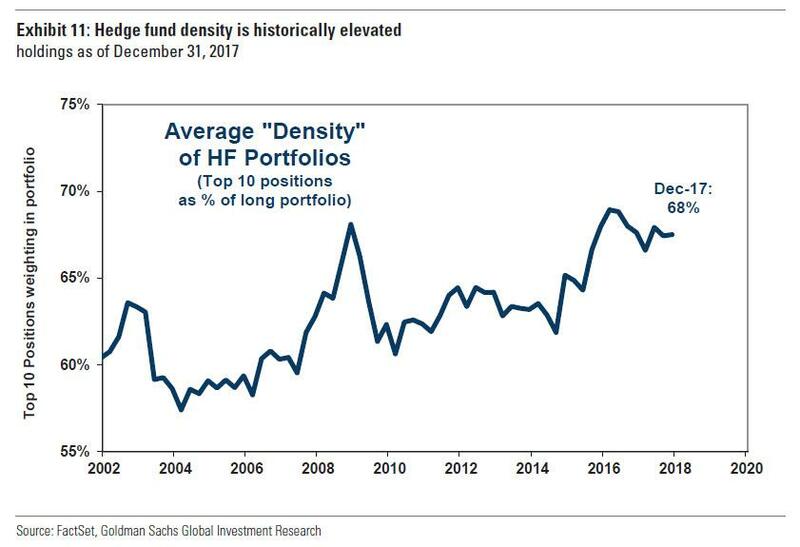 The increase in hedge fund portfolio density in recent years mirrors the growing share of S&P 500 market cap accounted for by the 10 largest index constituents, which now sits just above the average level since 1990 (22%). 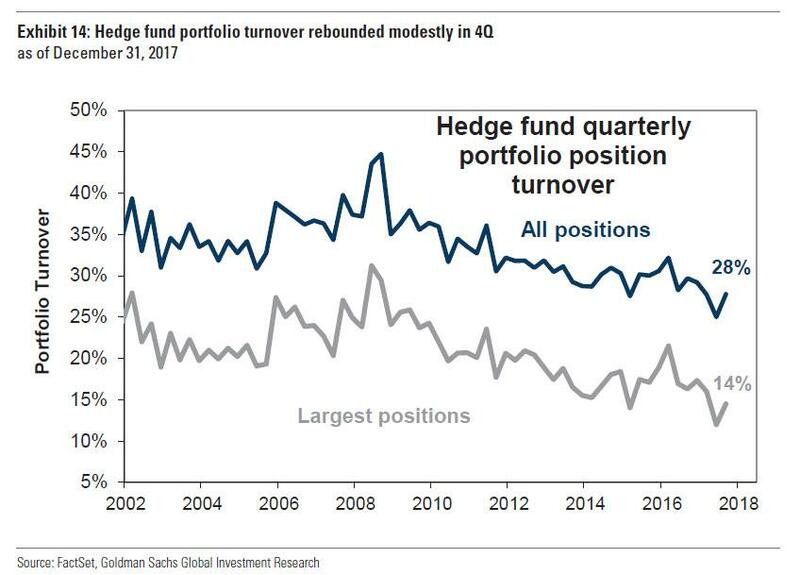 Separately, while hedge fund portfolio turnover rose slightly from a record low during 4Q, funds clearly remained committed to their top positions. "Across all portfolio positions, turnover registered 28%. Turnover of the largest quartile of positions, which make up the vast majority of portfolios, also rose slightly to 14% but remained near historical lows." 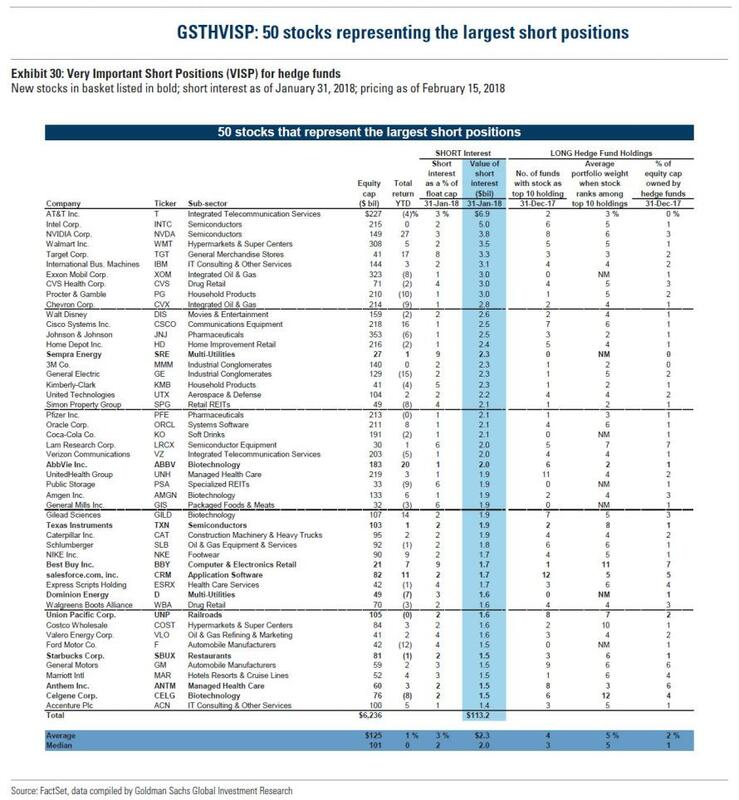 So putting it all together, below are the 50 hedge fund positions compiled by Goldman which make up the latest GS VIP list, i.e., the 50 most popular hedge fund longs, also known as the "Hedge fund Hotel California." ... the basket tends to get hit especially hard: quote Goldman, "although the basket has been a strong historical performer, it suffered its worst historical underperformance vs. the S&P 500 in late 2015 and 1H 2016 (-17% vs. -3%)." But good news followed, because thanks to another coordinated central bank intervention (the Shanghai Accord) the basket then rallied back to outperform the S&P 500 by 21 percentage points (+52% vs. +31%) between 2H 2016 and early 4Q 2017. 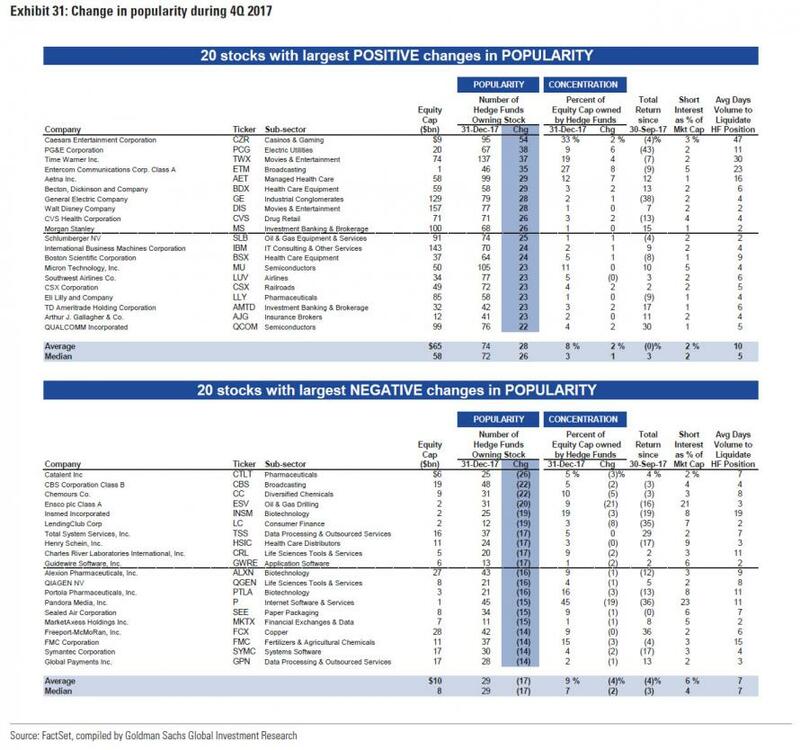 Conversely, below are the 50 most shorted positions, i.e., the stocks which represent the most important short positions. 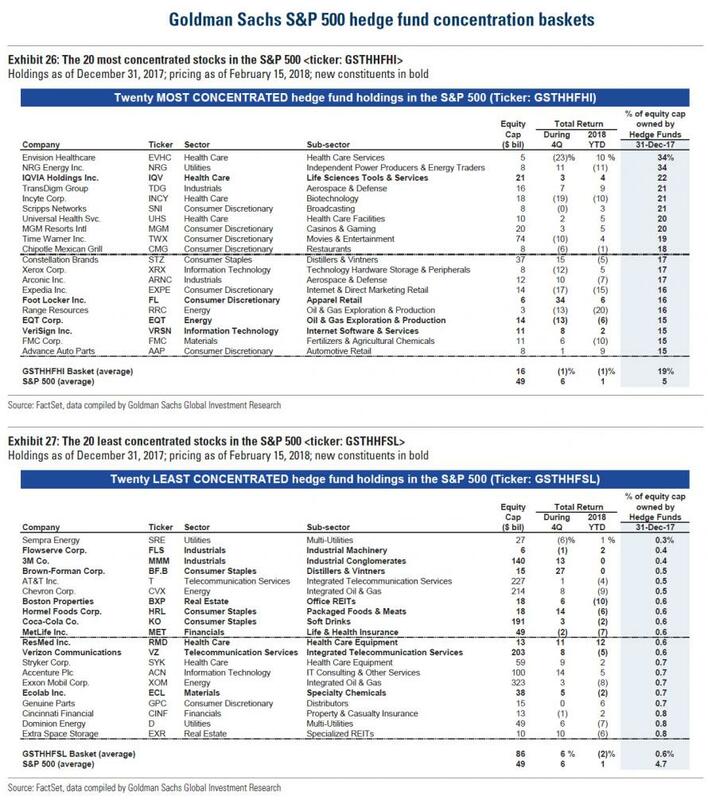 Finally, beware entering extremely crowded "smart money" positions: Goldman writes that the most concentrated hedge fund stocks - those who have the highest portion of their market cap held by hedge funds- have lagged the S&P 500 by 200 bp YTD following unusually weak returns in 2017. The basket of 20 firms with the largest share of market cap owned by hedge funds (ticker: GSTHHFHI) has lagged the S&P 500 by 11 pp in 2017, its worst annual performance since 2007. The weakness was driven primarily by two Health Care firms (EVHC and INCY). The basket had outgained the S&P 500 by an average of 9 pp in each of the five years from 2012-16.